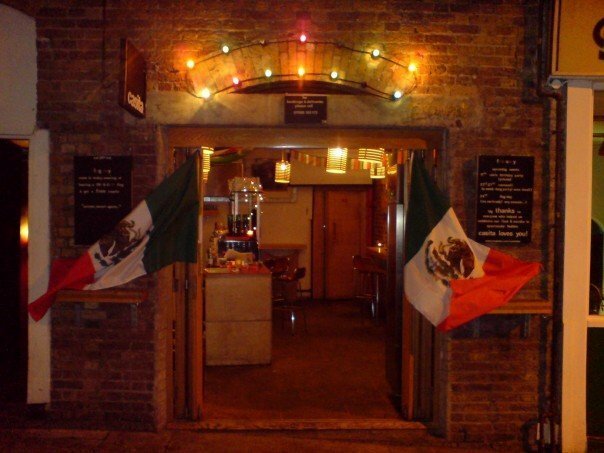 Type of Bar: Easy-going, Tiny, Latin? I kinda don’t want to tell you about Casita. Just round the corner from The Book Club with its queue of people who just don’t know any better, Casita is a tiny cocktail space with a whole lot of character. The Latin vibe of the place which is stressed in many reviews is barely noticeable in the crowded room, especially if you need to make your way to the bar. Luckily, the density of the crowd ebbs and flows, so as soon as you get some breathing space, you get a chance to get to know the wonderful bartenders. Always cheeky, up for conversation and a casual flirt, they know what they’re doing and will do whatever it takes to make sure you’re stumbling by last call at 11PM. Don’t be surprised by on-the-house shots of the bar signature Tequila con Verdita, which you’ll find yourself doing more of than expected (between-drinks palette cleansers I claim they are). The shot of El Jimenez tequila with a chaser of coriander, mint, pineapple juice and fresh jalepenos will keep you coming back for more as you go through their list of expertly made classics like a Tommy’s Margarita (Tequila, agave nectar and lime, as usual), or a good old King of Roses: a sweet gingerbread syrup and Four Roses bourbon. If they have their hands on honey syrup, I highly recommend the Gold Rush, honey syrup, whiskey and lemon juice; or its gin cousin, the Bee’s Knees. They exemplify Casita’s nature: Simplicity, yet well done and supremely satisfying. You could go off menu as well; a Sazerac I ordered came out fabulously – except it may have been served with ice (faux pas), but I can’t quite remember by the time I got to that drink. I believe I did experiment by ordering a rum daiquiri with Cynar artichoke bitter liqueur and loved it – not on their menu, but they will be happy to make this cocktail with a savoury roundedness for you. And that’s the charm of the place; it’s a place to get disgracefully drunk without the risk of drinking something horrible. As for food, the bar offers a selection of take away menus to bring food to the bar for you: which reflects Casita’s incredibly laid back nature. Or you could steal their blackberries to eat. As long as you’re not causing drama, they’re happy as long as you are. The monetary damage is minimal – four drinks and four shots got a tab for 40 pounds, pretty fantastic for the quality. For the high rating, you must understand that we can’t limit high ratings to cushy table service bars with drinks at 16 pounds a pop as some reviewers think we must. If you want a shameless night out pressed up against strangers with a bad drink, go to a London Cocktail Club branch. If you want a shameless night out pressed up against strangers with a spectacular Nuclear Daiquiri in one hand and blinding Tequila con Verdita in the other, Casita is your destination. Update: The glorious Casita bartender, Oskar, is retiring end of May 2014! We love him dearly and will miss him terribly, and wish him best of luck in his next, mysterious cocktail venture! Watch this space! 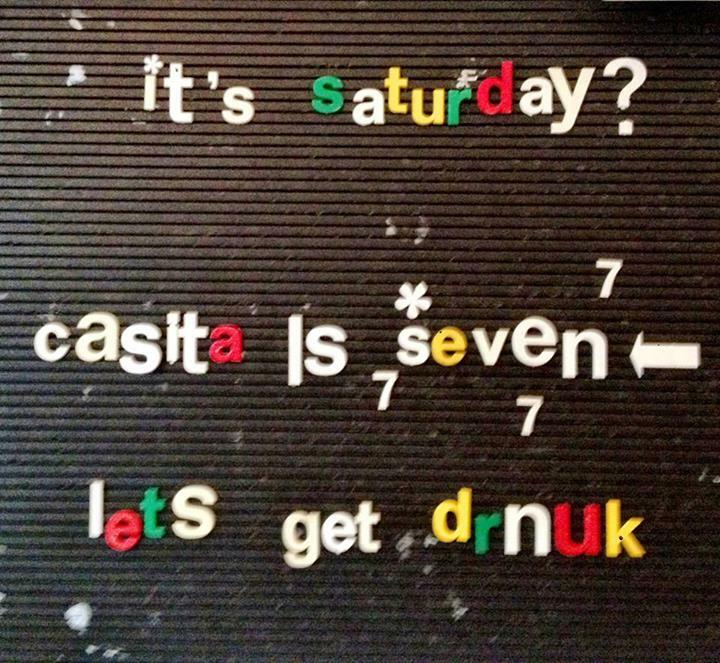 Update: Click HERE to for article on Casita Bar’s 8th Birthday feat. Ocho Tequila! A spectacle to multiple invited startenders and their cocktails!